Day 2 Low Dose steroids *blog #2* – Living life the MegaSpecial way! So after the 3 hours cat-napping I had last night I’ve actually had a really good day! I certainly didn’t expect to feel as awake as I have, which is saying something as I’ve felt as though at some point during the early hours I felt as though I was thwacked across the head with a baseball bat! A bit melodramatic? Welcome to the world of the MegaSpecial on Prednisone steroids where ANY thing goes! Buckle in, it’s gonna be a bumpy ride. It’s been our normalish Sunday, we took Ollie our 12 year female Labrador with hip dysplasia to her regular hydrotherapy, then lunch at The Weavers Arms and home for a film. 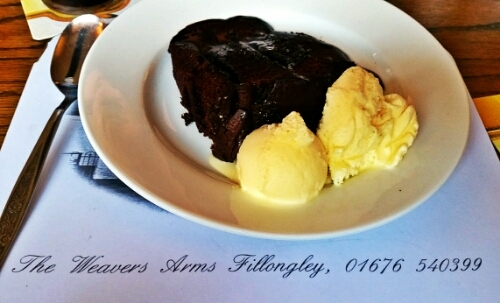 Special thanks to Shelley & Deb for twisting my arm (Shelley mostly) making me indulge in a warm chocolate fudge cake and icecream for desert at The Weavers! A special treat, not that I have it often! What!? Shhh! Oh wait, I missed the most important thing out… Sunday morning at the gym, well that’s because I didn’t go! Resting my body and all that! I have to remember to be kind to myself whilst I’m on these steroids for a possible MS relapse. Did I forget to say anything else about today? Of course, my bright red cherry tomatoe hamster pouch steroid face! My check bones have nearly vanished (again) & I look like I’ve done one of Kate Kings hour long fast paced Pilates classes! I wish! But I’m used to this flushed look now so I can handle it. I’ve been doing so well on my diet, so people keep reminding me! I’m one of those that ‘can surely always do better despite my Chronic illness!’ right? I need to stop being so hard on myself! Two stone lighter and then I go and have to take a course of Prednisone steroids which have to be one of the worst drugs for weight gain that I know! Oh yeah, there is that other drug that I was made to eat earlier! The drug of Chocolate cake, that is surely as bad as steroids! No? Worse? Really! Woops! I think I’ll wrap it up there! I’m pleased with how my 2 days have been so far, no real improvement with the suspected relapse but like I say it’s only day 2! Another very late night, I hope this insomnia doesn’t last too long. It’s a horrible thing insomnia! A very lonely time indeed when only a handful of my friends that ‘get me’ are still awake! ‘The spoonies’ as we tend to get called! These aren’t just people that have MS, these are friends that have different Chronic illnesses. Day 2 Low dose steroids blog number 1! Fact: Low dose steroids still cause me insomnia!